"Hunter" went to live in the USA in 1999. He is co-owned by Jim Bass, Ken Adcox ("Tribalfox") & Sharon Clark ("Swan Lake"). 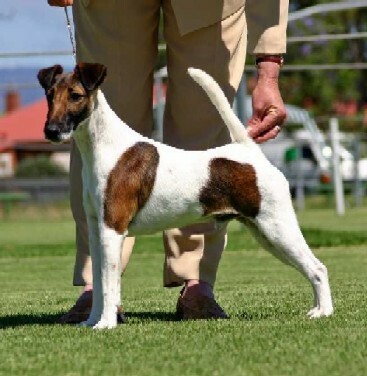 He is the sire of four Champions, Ch Mirolinda Hot Gossip, Am Ch Tribalfox Let it Ride NAJ, Am Ch Swan Lakes Heiress of Tribalfox ROM, Am Ch Swan Lakes Apparently So and grandsire of Aust/Am Ch Tribalfox Coronado and Ch Tribalfox Pow Wow. We thank Jim, Ken & Sharon for campaigning this young dog and hope he will continue to produce well for them. 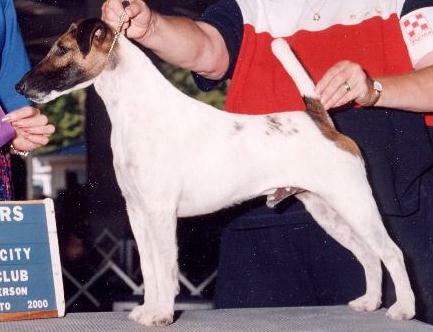 "JJ" made his debut at the Fox Terrier Specialty on 03/09/2005 and went Best Baby in Show. 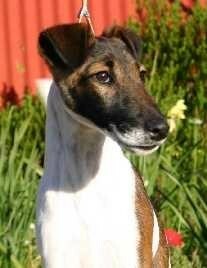 "JJ" has also Puppy & Junior in Group awards to his credit, the same as his three half sisters. "JJ" now resides in the USA with Jim Bass and Ken Adcox "Tribalfox". Whilst we like being able to send our dogs overseas to be shown in other countries, the cost in getting them there is very expensive. To most European countries and the UK the cost of shipping is around $2,000.00AUD. To the USA and Asian countries it is slightly less in cost. If you are interested in purchasing one of our dogs or placing an order with us - please contact Dogtainers one of our shipping companies direct for a quote: adelaide@dogtainers.com.au (all shipping costs can be paid direct to Dogtainers via bank transfer, cheque or visa). If after your quote you are still keen to place an order with us, please feel free to contact us to discuss your requirements.